Ronnie O'Sullivan, seen by many as the greatest snooker player of all time, succumbed to one of sport's biggest shock defeats when he was beaten by amateur James Cahill in the first round of the World Championship on Tuesday. Ronnie O'Sullivan became the first snooker player in history to make 1000 career century breaks as he clinched the Players Championship title in Preston. Ronnie O'Sullivan hopes to continue to make snooker history after he claimed a record seventh UK Championship crown in York. Tyson Fury says he has appointed snooker star Ronnie O'Sullivan to his support team ahead of his comeback fight next month. Mark Williams has won the World Snooker Championship at the Crucible, beating John Higgins 18-16 in the final in Sheffield. Mark Allen fought off a spirited performance from Kyren Wilson to win his first Masters title with a 10-7 victory at Alexandra Palace. Ronnie O'Sullivan was "glad" his bid for an eighth Masters title was over after struggling with illness in his 6-1 quarterfinal loss to Mark Allen. Ronnie O'Sullivan took a series of 'power naps' during his last 16 victory over Li Hang at the Scottish Open in Glasgow. Ronnie O'Sullivan grabbed a share of two of snooker's great records as he landed his sixth Betway UK Championship title in stunning fashion. 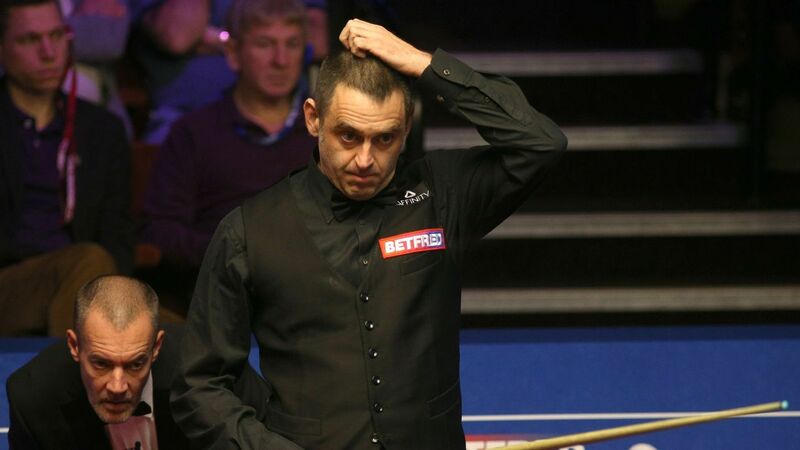 O'Sullivan to swap snooker for snakes? Ronnie O'Sullivan could swap snooker for snakes after the five-time world champion declared he would be ready to take on the 'I'm a Celebrity' jungle next year. Former world snooker champion Stuart Bingham has been banned from the sport for six months with three suspended for breaching betting regulations. Mark Selby pulled off one of the most astonishing victories in a Crucible final as he landed his third Betfred World Championship title. John Higgins seized on a nervy start from Mark Selby to take early charge of the Betfred World Championship final on Sunday. Mark Selby moved one step away from a third Betfred World Championship title in four years as he saw off Ding Junhui again at the Crucible. Ronnie O'Sullivan bowed out of the Betfred World Championship at the hands of Ding Junhui -- but not before surprising the Crucible crowd by appearing to deliberately avoid a 147 break. Ronnie O'Sullivan fired notice of his hunger to land a sixth world title as he ruthlessly saw off Shaun Murphy to reach the quarter-finals of the Betfred World Championship in Sheffield. Snooker's world championship is marking its 40th year at the Crucible Theatre, but the quirkiness of the arena is matched by the tales and travels of the fans who have attended for decades. Ronnie O'Sullivan has raised the familiar red flag of a retirement threat after accusing World Snooker chairman Barry Hearn of leading an institution that has bullied him. Fergal O'Brien has qualified for the World Championships after clinching the longest frame in the history of snooker to edge out David Gilbert 10-9. Reanne Evans' campaign to become the first female at the World Championship must wait for at least another year. Reanne Evans is two wins away from becoming the first female competitor in the World Championship, after a 10-8 upset victory over Robin Hull in qualifying. Former world snooker champion Stuart Bingham has said he will accept whatever punishment comes his way after admitting he broke the sport's betting rules. Former world snooker champion Stuart Bingham has been charged with a breach of betting rules by the sport's governing body, the WPBSA. Ronnie O'Sullivan sang lyrics from Oasis hit 'Wonderwall' during a very strange post-match interview. Watch the very best in U.S. sport LIVE and on-demand with ESPN Player. Available across Europe, subscribe today.